Bulk Activation will activate all scheduled students for a selected number of assessments. Depending on the number of assessments selected and the number of students scheduled, this process may require overnight processing. There are two options available in the Assessment Manager: Bulk Activate in the Bulk Toolbar or the Activate option in the Functions drop-down list. Bulk Activate for Online Testing is permission-based. Admin Users may grant this permission in the Roles tab of the Admin module. Admin Users may allow other users the ability to bulk activate assessments for online testing. 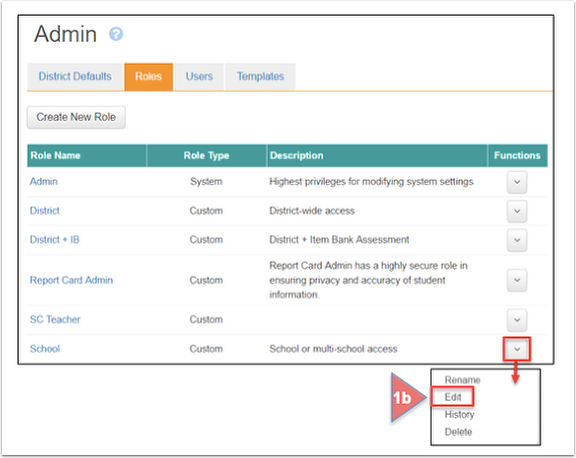 District Role: In the Assessment tab, find Bulk Activate Online Testing in the header. The District Role may be given permission to Bulk Activate for District assessments (None, My, All). None means the user cannot bulk activate for any assessment. My means the user can only bulk activate for the assessments he/she has created. All means the user can bulk activate all assessments. School Role: The School Role may be given permission to Bulk Activate Online Testing for assessments at the School level (None, My, All) and/or at the District level (None, My, All). Teacher Role: The Teacher Role may be given permission to Bulk Activate Online Testing for assessments at the School level (None, My, All) and/or at the District level (None, My, All). 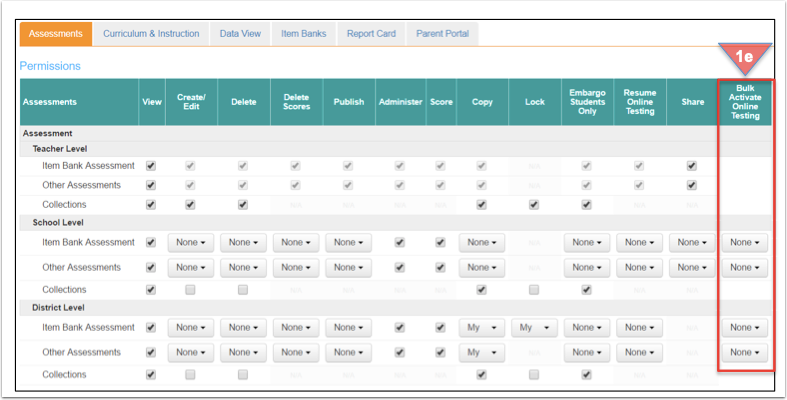 This function allows users with permission to bulk activate multiple assessments at the same time. Once one or more assessments are checked, and the Bulk Activate icon is clicked, one of several confirmation messages will display, depending on the availability and setup of the selected assessments. From the Launchpad, click on the grid icon, and select Assessments. Note: Please see the Help document, Basic Navigation Navigating the Launchpad 6.0, for more information. Check the box next to the left of each assessment name to be bulk activated. Select the Bulk Activate icon in the bulk functions bar. Read the message that appears, and take the appropriate action. For this message, click Proceed with Bulk Activation. Note that this activates all scheduled students for these assessments. If a 4 Digit PIN has been selected as an online property in assessment setup, then you must decide to assign a unique PIN to each assessment (for all students) or assign the same PIN foer all assessments. Then Proceed with Bulk Activation. A confirmation message will appear. Click Take me to Bulk Activations, or Exit. In the Manage Bulk Activations screen, note the columns: Assessment Name, Date Requested, Requested By, PIN (if PIN was selected as an online property during setup), Status of the Bulk request, and Functions (Inactivate, and Delete). Note: The blue information message at the top of the screen indicates overnight processing time needed. Once activation has occurred, the Online Admin icon will be bolded and students can begin testing in the Student Portal. This function allows users with permission to bulk activate for “selected” students for one assessment. From the Assessment Manager, click on the drop down arrow under Functions, and select Activate. This action will take the user to Advanced Settings: Scheduling Students. From the originally scheduled students, select the schools, teachers, classes and/or students to be activated by checking the appropriate box(es). The number of students selected for activation will appear in the lower left hand corner. Activate Selected Students will appear in the lower right hand corner. Click here to activate. A confirmation message will appear. Click OK to continue. The Selected students may now begin online testing in the Student Portal. Please refer to the Help document, Administer Assessments: Advanced Settings-Scheduling Students for more information.